Want to get certified in PRP procedure? Here's a list of prp certification courses for providers who want to confidently offer PRP to their clients. Here's a list of prp therapy providers who use DrPRP in their practice. Browse through to find the ideal provider. Learn more about our patented PRP Injection Kit for Platelet Separation. With Dr. PRP, you'll get highly concentrated Platelet Rich Plasma in minutes. Learn more about this new stemcell-derived Anti-aging skin care. With Stem cytokines, a powerful factor in restoring your youth. Ask for a no-obligation consultation and learn more about the cutting edge regenerative therapy protocols that your customers will love to know. Click HERE or fill out the form below. The use of immunosuppressive biologics, non-steroidal drugs (NSAIDs) and corticosteroids, collectively known as Anti-Inflammatory Therapeutics (AIT), has been rebuked by many, including well-known MDs. But there are, still, a good majority of family doctors, pain-management specialists, and orthopedic surgeons who routinely prescribe them for arthritis, tendonitis, and bursitis because apparently, there’s no other better alternative. This is evident in the ballooning anti-inflammatory therapeutics market which is projected to reach a valuation of $100 Billion by 2020. But according to researchers, there already exists a better alternative and that is Platelet-Rich Plasma and scores of physicians are now prescribing it as a first line treatment instead of AITs. One of the reasons why AITs are popular is the belief that most musculoskeletal diseases are due to inflammation. It is believed that inflammation is the cause of injuries and pain. But over the years, numerous studies have shown, rather persuasively, that inflammation is a signaling process used by the body to recruit growth factors and cytokines to the tissue microenvironment. While suppressing the inflammation with drugs interrupts this natural process and provides short term relief to the symptoms, in the long run, it prevents structural healing. But the argument among pro-AIT physicians is that they provide the best short term relief. They claim that a short or two of AITs keeps the situation under control and is not a big deal in the larger scheme of things. Not true. They have pain-relieving properties but not as dramatic as we may think. First, corticosteroids are not as the ultimate pain-killers and there are other methods far superior. Second, neither can NSAIDs be considered the most effective pain-killers and that’s a fact. Third, the immunosuppressive biologics like DMARDS, cytokine-blockers and TNF-blockers are not effective pain-killers anyway. But they all have one thing in common. And that is, a long-list of side effects. It would have been acceptable if we could just temporarily harness the whatever little pain-relief that AITs offered while we’re looking for a favorable course of action. But that isn’t the case. Studies show that even a single dose of these AITs can lead to unwanted complications. Let’s take a deeper look. Steroids are evidently the most destructive ones. Physicians know that they must prescribe steroids very cautiously. But the problem is once they work, patients may prefer them again and again. Especially athletes who just want to get back in the arena for that final game. After all, who wants to sit on the sidelines when life passes by? Just one more time, they’ll say. But the long term effects are disastrous. Not only are they hard to get off of, the steroids have the ability to kill mesenchymal stem cells, lead to cartilage loss, and are one of the most common causes of secondary osteoporosis. Scores of athletes and weekend warriors have used steroids to temporarily push away pain only to end up in the surgery table a few years later. NSAIDs are a totally different beast. Medscape reports that more than 70 million of them are prescribed to patients each year in the United States alone. This is in spite of the warning issued by the Arthritis, Rheumatism, and Aging Medical Information System (ARAMIS) against NSAID use. To the patient, it sounds like a decent proposal – use non-steroidal drug to temporarily alleviate pain. However, the consequences are enormous. In this comprehensively researched article on the Journal of Prolotherapy, the writer calls for a total ban on the use of NSAIDs for joints owing to its potential for degenerating cartilage. This is alarming considering that majority of the NSAIDs are prescribed for joint conditions like arthritis. In another study, use of NSAIDs was shown to have tripled the progression of Knee Osteoarthritis. Furthermore, even in the 1980s researchers have found that NSAIDs can disrupt intestinal integrity. Anti-inflammatory biologics include drugs that block pro-inflammatory cytokines like tumor necrosis factor alpha (TNF) and interlukin-6 (IL-6) as well as conventional disease-modifying antirheumatic drugs (DMARDs). The problem with these drugs is that they suppress the biologic entities responsible for the natural immunity of the body. Applying them to a joint for example, doesn’t limit its effect to that area. Instead, it suppresses these biologic entities THROUGHOUT the body including liver, colon, small intestine, bones, skin and even neurons. That’s why they have been linked to neurological diseases, and other diseases. Blocking pro-inflammatory cytokines are definitely a bad idea. For example, the cytokine IL-6, one of the main cytokines targeted by the new generation of Arthritis drugs is a major component of the central nervous system. So is anti-TNF drugs. Blocking these can only lead to adverse events in the long term elsewhere in the body. Can PRP Disrupt The Anti-Inflammatory Therapeutics Market? Although not immediately evident, the trend for these Anti-inflammatory Therapeutics are actually going down. As researchers discover more serious side effects, the market will start shifting to more natural solutions like Platelet-Rich Plasma. In fact, it’s already happening as we speak. Even without the support of insurance companies, more and more people are opting for PRP instead of AITs. That means people are willing to pay out-of-pocket for PRP instead of accepting free drugs. In other words, the downward trend for AITs has begun. Patients and physicians are learning the hard way that SUPPRESSION OF INFLAMMATION DOES NOT EQUAL TO HEALING. On the other hand, the trend for Platelet-Rich Plasma is climbing organically. Here’s Allen Mishra’s tweet about PRP’s Google trends. Alan is the founder of the Biologic Orthopedic Society that has over 6,500 members in Linkedin. The study shows that sacroiliac joint (SIJ) injection of Platelet-Rich Plasma has a longer-lasting effect on pain than steroids. And the difference is HUGE. While efficacy of steroids was only 25% at 3 months, it was 90% for PRP. In this study, the steroids were only able to suppress symptoms for recalcitrant lateral epicondylitis, while PRP was able to biologically heal the lesion. Furthermore, the steroids caused further tendon degeneration. Another study proved that patients who had PRP shows better pain and functional improvements than patients who had corticosteroid injection. This randomized, blinded study concluded that PRP delivered at least the same pain-relief results as steroids. Other researchers have concluded that PRP is actually more effective than steroid injection in terms of pain and functional results. Another study also proved that PRP was more effective and durable than cortisone for plantar fasciitis. Yet another British study also pointed out that PRP injections are superior to corticosteroid injections. The study above showed that intra-articular PRP injections are better than HA, ozone, and corticosteroids. Another study recently proved that PRP injections are better than Hyaluronic Acid for knee osteoarthritis. This study proved that Platelet-Rich Plasma injections show benefit earlier than cortisone injections for rotator cuff tears. Another similar study also found that a single dose of PRP is better than steroid for Shoulder impingement syndrome. As you can see, the reason why more and more physicians and patients favor Platelet-Rich Plasma over Anti-inflammatory Therapeutics is that PRP not only eliminates the symptoms (pain and function) but it actually heals biologically. Yes, of course, the manufacturers of the conventional drugs would love you to believe that their billion-dollar-research-backed miracle drug is VASTLY superior to the autologous Platelet-Rich Plasma that can be produced within 10-20 minutes in a small clinic. But what we’ve seen is quite the opposite. And that requires a tipping point in its adoption by physicians. It’s already accelerating at a good pace. For the patients, Platelet-Rich Plasma has been helping them avoid surgery for years now. See the videos below for actual testimonials from real patients. Here’s another patient’s story of how PRP helped avoid surgery. And the patient vowed to never go through that ever again. Unfortunately, the patient suffered another injury in 2014. But this time decided to try Platelet-Rich Plasma instead. The patient reported that by February 2015, the shoulder was 80% healed. The doctor advised the patient to have a second PRP injection to heal the remaining 20%. Watch this second video for another excellent patient story. 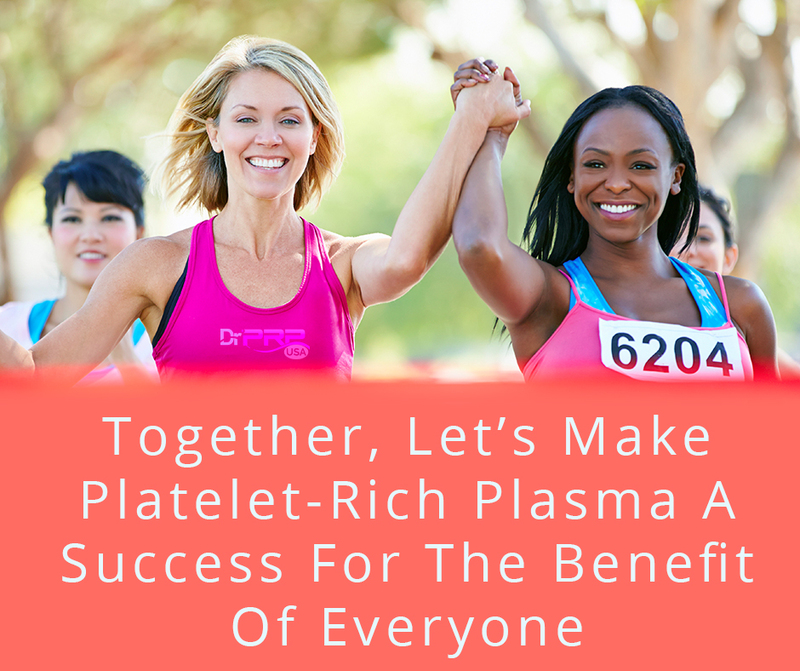 The best way to start making a big difference in your patients, especially if you’re an orthopedic surgeon, rheumatologist or any kind of pain management specialist, is to get going with Platelet-Rich Plasma. Don’t just have it as a back up treatment that you can try when things don’t go well. Instead, it can be used as a standard first-line treatment for musculoskeletal issues. Give it a serious consideration. We can guarantee that once you start offering Platelet-Rich Plasma, you’ll end up prescribing less and less Anti-Inflammatory Therapeutics and more and more Platelet-Rich Plasma. And it will have a tremendous impact on the lives of your patients. We want to see a world where the “replacement surgeries” are a thing of the past. And Platelet-Rich Plasma can make it happen. Give us a call if you need more information. We can be reached at (844) 377-7787 or email via hello@drprpusa.com. Or you can order a Platelet-Rich Plasma kit online and try it in your practice. Together, let’s welcome the Anabolic Era of Medicine. In 2011, Stanford University researcher Jason L. Dragoo, reported that there are over 86,000 PRP Injections performed in the US each year. Market analysis by exerts put the growth rate of the Platelet-Rich Plasma market at almost 12% compounded rate which means that the number is probably 170,000 this year. Yes, well over 170,000 PRP injections are performed annually in the US. A recent scientific research by Russian researchers claim that patients save about US$876.84 on average when choosing Platelet-Rich Plasma over conventional treatments. This researchers included only data for PRP applied for wound healing. But we believe the savings for sports injuries and arthritis patients to be much higher. That’s a WHOPPING $149 million in COSTS SAVED BY PRP INJECTIONS in the US alone. And we’re just scratching the surface here. Stephen Clark, PT, DPT, MBA, OCS, president and founder of Athletic Physical Therapy in Los Angeles, notes that “the number of physicians performing PRP procedures has skyrocketed during the past 5 years.” This correlates to the aggressive demand we’re seeing for this safe and autologous treatment. The patients can’t find enough physicians performing the procedure. We receive inquiries from patients wanting to do the treatments and some are even willing to go out of state if there’s none in their area. Watch this response from this patient about her PRP injections. And patients like Ken below come back for more after their initial injection. The science, however, is just catching up with this trend. Recent FDA-Sanctioned, Randomized, Double-blind, Placebo-controlled study and Meta-analysis of Level 1 Randomized Controlled Trials continue validating Platelet-Rich Plasma’s role as a better therapeutic tool than conventional treatments. The big stumbling block for PRP is insurance acceptance. Right now, the insurance companies gleefully ignore the 0232T code – the CPT code for Platelet-Rich Plasma injections, with or without image guidance including its harvesting and preparation. But as they’ll soon realize, not accepting PRP injections is actually costing them a lot of money down the road. That’s why many physicians we talk to believe that it’s only a matter of time before the insurance start accepting it. But even if it remains that patients have pay out of the pocket for these injections, it still is a very cost-efficient way for them to deal chronic injuries and degeneration. Here are six ways we know. Typical drug-based approach to healthcare is more symptom management than true healing. This is because the drugs typically do nothing to promote the reversal of the root cause. Instead, they’re good at masking the symptoms. The implications of this are vast when it comes to cost. Since the root cause is not addressed, the patient becomes dependent on the drugs as the disease progresses and symptoms recur. Each time they’re given a stronger dose or a different drug until it no longer works. Now, compare that to Platelet-Rich Plasma’s approach to actually correct the root cause by promoting healing of the broken or degenerated tissues. Often patients are healed by just one or two injections. And they’re happy for years. In the long run, the patient who’d had Platelet-Rich Plasma Injections are less likely to develop complications leading to surgery. This is huge. Analysts estimate that there are over 600 thousand knee-replacement surgeries performed every year. When people think of the cost of these surgeries, even minimally invasive ones, they only look at the hospital bill that may be covered by the insurance provider. But there are numerous other costs like loss productivity due to patient’s downtime, psychological costs, and even miscellaneous costs during the patient’s stay in the hospital. Moreover, stuff like arthroscopic surgery, the most common orthopedic surgical procedure, has a history of leading to further deterioration and arthritis. So the patient’s actual costs are high. All of these are eliminated when you suggest your patients choose Platelet-Rich Plasma at an earlier stage. According to this paper, post-surgical complications can exceed $10,000 for each patient. That is just for surgeries. What about complications due to side effects of drugs? Research indicate that it’s about $1300 per adverse drug reactions. In fact, medical complications and side effects are some of the biggest cost burdens associated with modern western medicine. Then there are scars associated with surgeries. Not to talk about downtime. Platelet-Rich Plasma on the other hand would have none of that troubles. This risk of injection is extremely low since it’s all autologous. And the procedure is done on an outpatient basis after which the patient can return to normal activities the following morning. All of these translates to increased savings every time you recommend Platelet-Rich Plasma for your patients. One of the problems with FDA-approved drugs is that they can only be prescribed for the stated purpose of use. A drug for arthritis patients can only be prescribed for arthritis patients even if it might help a patient with tendonitis. Thus if the patient has more than one orthopedic conditions, chances are each one will need different drugs specifically approved for that condition. Take arthritis and osteoporosis – they are treated completely different when using FDA-approved injections. You get the point. The possibilities are endless. This means that the patient do not have to get an assortment of drugs if they need relief for multiple symptoms and thus there is no cost of acquiring new drugs (or potentially leaving drugs unused) each time they have a symptom. This is one of the main advantage of Platelet-Rich Plasma injections. Unlike FDA-regulated drugs, for which the companies spend millions of dollars for research, several times more on marketing and mass production, there’s little capital costs involved with Platelet-Rich Plasma. To produce it, all you will need to invest in is a good PRP Kit and a centrifuge and the patients can come and get the PRP injections unlimited number of times. All the research on Platelet-Rich Plasma is done by independent researchers around the world and there’s one no single entity who’s licensing it. So customers aren’t paying for bloated research funding and marketing costs. This means you can afford to charge your patients less. The process of getting admitted to a hospital is mentally taxing. And most of the surgical procedures, however minimal require hospitalization. And that means you need big equipments and all sort of things. So only big hospitals can do those. There is an endless list of charges that the hospital needs to include as a standard and depending on the co-pay agreement with their insurance, the patients may end up paying anywhere from 10% to 50% of these extra unnecessary charges. With Platelet-Rich Plasma, though, it is an outpatient treatment done in small, independent clinics as a 45-minute procedure. And these clinics are very cost-efficient in their operations because they do not need to employ a lot of staff. The takeaway? Patients pay significantly less compared to surgeries. And the small, independent clinics have a big advantage over large hospitals. Platelet-Rich Plasma is here to stay. The skyrocketing demand is proof. And there is no reason why you shouldn’t be offering it. Thousands of cases prove that it works. We’ve shown you how it saves your patients money. If you’re an orthopedic surgeon, rheumatologist, and/or run a pain management clinic, you’re doing a tremendous disservice to your patients if you’re not suggesting Platelet-Rich Plasma to your patients. Because Platelet-Rich Plasma has the highest adoption rate in this field – and for a reason. It has become indispensable. The second group of people who uses PRP is aesthetic professionals followed by ophthalmic surgeons. We’ll let some of the stories from Physicians themselves convince you about offering Platelet-Rich Plasma. Here’s one physician who saw the value in Platelet-Rich Plasma ONLY when he himself was forced to seek the treatment. Another dentist reports that he’s been using it for more than 8 years for grafting procedures. PRP is very effective in bone grafting procedures with a huge amount of research supporting it’s effect in speeding healing. It’s use in tendonitis seems to be questionable. I am an oral & maxillofacial surgeon and have used it for greater than eight years with great success in my grafting procedures in the jaws. The point is, we could go on and on and on about the reasons why a lot of physicians are excited about this treatment. It is simple and practical enough to quickly adopt it into your practice. And the risks are absolutely minimal. That being said, you might want to undergo training for advanced prp injections at the Interventional Orthopedics foundation. Because, the ability to accurately localize the Platelet-Rich Plasma is one of the biggest needle movers when it comes to extracting the maximum therapeutic benefits. According to the foundation, only 1% of the physicians are able to do these precise injections without training. And so, chances are you may not have had the training. The Interventional Orthopedics Foundation also offer home study videos if you’re not able to attend in-person. And if you need help setting up your Platelet-Rich Plasma workbench, we’re here to help. Give us a call at (844) 377-7787 or drop us an email via hello@drprpusa.com. We handle everything from PRP kits to centrifuges to workspace for PRP and marketing brochures. Why Are We Still Debating Platelet-Rich Plasma? In the 2000s, when Platelet-Rich Plasma first started shifting its role from being a healing assistant in cardiac and orthodontic surgeries to the more leading role of healing bone grafts and joint tissues, many leading physicians claimed that the practitioners were putting profiteering before truth and science. They even said it was outright theft to charge $300 for an injection that, according to them, had an efficacy no less than placebo. That was in 2009 and the confusion back then was justifiable. Fast forward 7 years later, in 2016, and we had the first FDA-Sanctioned, Randomized, Double-blind, Placebo-controlled Clinical Trial on Platelet-Rich Plasma for Knee Osteoarthritis which showed that PRP improved the outcome by 78% compared to 7% for placebo. This was also confirmed by two Chinese major review studies this year, both Meta-analysis of Randomized Controlled Trials of Platelet-Rich Plasma for Knee Osteoarthritis – first one here and the second one here. Yet, we still see physicians here in the US – orthopedists and rheumatologists, among them – who don’t even bother to try it once on their patients! Platelet-Rich Plasma, as we know, contains 7X-9X concentration of platelets in a serum with a balanced ratio of plasma, leukocytes and RBC. This special mixture helps supply growth factors and other proteins that tissues can use to recruit stem cells and heal itself. This process is pretty straight-forward. Yet, we know for a fact that there are some physicians who fail to see results with Platelet-Rich Plasma, including some clinical studies performed by veterans. We suspect it has got to do with the second part to PRP’s healing mechanism. It’s right application. It can be summed up in the following two questions. 1. Precisely which tissue are you delivering the PRP to? 2. How are you making sure that the PRP is used by the tissues and not wasted? This is where the science of Interventional Orthopedics come into play. On the outside, interventional orthopedics look very simple. You identify the area which needs healing, and then administer Platelet-Rich Plasma (or stem cells for that matter) to that particular area and wait for it to heal. Thinking that its this simple screws up the process for physicians who’re merely trying their luck with PRP. Because, the bulk of the Platelet-Rich Plasma treatment – the actual work that the physicians need to do – has to do with the following. 3) Delivering Platelet-Rich Plasma precisely at that location. These advanced injections are much more effective and requires a different level of expertise. For example, typical injections in the knee can only deliver the Platelet-Rich Plasma serum to the synovial fluid, synovial membrane and articular cartilage. The advanced injections like intraosseous infiltrations can deliver the PRP serum to the subchondral bone and the deep layers of cartilage that are affected by Osteoarthritis. These kind of advanced injections require the use of fluoroscopic guidance for proper administration as well as proper training on the physician’s side. Here’s one study that explains why accurate localization is linked with an improved clinical outcome – Study of intra-articular infiltrations with intra-osseous injections of Platelet-Rich Plasma. The thing is, not all physicians are trained to do it. The scope of these advanced injections are vast and warrant extensive training and expertise. Most physicians, instead of getting highly proficient in identifying and administering precise PRP injections, they get concerned over the relative lack of protocols for PRP Injections. They get carried away by details like the frequency of the injection, the leukocyte levels, and red blood cells, when the fact is… as long as you get the platelet concentration right (5X-9X baseline), the therapeutic effects are guaranteed. The frequency and the presence of Leukocytes are minor factors that have little to no impact on the outcome. The most important factor is physician training for advanced injections under Ultrasound or Fluoroscopy. There is another concern among some physician who claim that there’s no evidence for the particular condition that they’re treating. For example, let’s say they’re treating Spinal muscular atrophy in a patient and see that there has been no study that proves Platelet-Rich Plasma is a good candidate. Does that mean it won’t work? Absolutely no. It just means no one has ever studied it in detail. The working mechanism behind Platelet-Rich Plasma is so universal that if it works for the knees, it will work for the spine and other similar areas of the body as well. In fact, there is almost no part of the body that is not currently known to have a therapeutic effect upon application of Platelet-Rich Plasma – nerves, joints, muscles, skin, hair, and even the eyes are treated by PRP. By the way, if you’re wondering if there really is a study on Platelet-Rich Plasma for Spinal Muscular Atrophy, here is one from Egyptian researchers. Does Age Play A Role? We’ve noticed that age does not have a correlation with the effectiveness of Platelet-Rich Plasma injections. It works just the same for the young and old. However, the one thing that do have a correlation is the degree to which the disease has advanced. The more advanced the disease, the less likely that Platelet-Rich Plasma can reverse its course. That is the reason why we recommend physicians treat Platelet-Rich Plasma as a first-line treatment for all possible conditions. It has already shown to be much more effective than both Cortisone and Hyaluronic Acid injections. So, back to the single biggest needle-mover when it comes to Platelet-Rich Plasma injections: ACCURATE LOCALIZATION. This means the physicians must undergo advanced training for this type of injections. And there are not many options available until recently. Thankfully, we now have the Interventional Orthopedics Foundation (IOF) foundation – the first non-profit in the US dedicated to providing training for core injection skills. According to IOF, only 1% of the physicians in the US are trained to do these advanced injections. And chances are you may not have been trained. With IOF, you can get trained for that in a real medical setting with skilled instructors and support staff. Injections for the healing of bone, tendon, ligaments, muscle or cartilage. Accurate localization of these injections on damaged structures using image guidance. New tools that facilitate percutaneous tissue manipulation. This is a wonderful non-profit education initiative by Christopher J. Centeno, MD, Gregory Lutz, MD, Don Buford, MD and Richard D. Striano D.C., RMSK, all leading players in the regenerative medicine field. Here’s a video you can watch to learn about IOF foundation. And check out the IOF membership information here. As a Platelet-Rich Plasma practitioner, you’ll be out on the leading-edge. You’ll discover things that others may not be aware of. And you’ll have the opportunity to publish your findings. That’s when you’ll think of a standardization. By then, it’s too late. You’ve already performed a lot of injections and your data in unstandardized. To avoid this, consider using a standard for the preparation of Platelet-Rich Plasma. We suggest using the latest MARSPILL classification for Platelet-Rich Plasma developed jointly by Brazilian and US researchers. The lack of standardization is the main culprit when it comes to debates over the efficacy of Platelet-Rich Plasma. We would love to see more and more researchers and everyday practitioners accepting a common standardized classification system for PRP. Here’s the chart for the MARSPILL classification. And you may also want to check out the DRPRP Kit for the most ideal concentration of Platelet-Rich Plasma. savior for many of these patients. It ushered in the anabolic era of treating Arthritis. Of course, this coincides with Platelet-Rich Plasma’s skyrocketing adoption rate and it’s media popularity. In fact, it has become so popular that, there is even a research paper about it’s popularity! Traditionally, the only road available for chronic knee arthritis patients was the road to total knee replacement. It will start out with the administration of corticosteroid injections. After going through that for quite a bit, the patient will show no further progress and the surgeon would suggest knee arthroscopy for debridement of affected tissues. That would feel better for a while before the patient returns for more. The surgeon would then give them a date for total knee replacement. All of that has changed with Platelet-Rich Plasma and Stem cell treatments. Now, we have found out that the best bet we have is to administer Platelet-Rich Plasma at the earliest stages of knee arthritis to regenerate the affected tissues as soon as possible. Platelet-Rich Plasma, with its growth factors and cytokines, not only relieves the symptoms but it is proven to reverse the condition as time goes by. It creates a very beneficial, positive cellular change in the joint pathology. All of that without the adverse effects of an invasive surgery. Right now, Platelet-Rich Plasma is used for a number of musculoskeletal conditions like Rotator cuff injuries, Tennis and golfer’s elbow, Ligament strains, Knee instability, Chronic back pain, Knee and Achilles tendonitis and more. There is no adverse effects or long term implications. Few other treatments can match this record. The important distinction to be made when comparing Platelet-Rich Plasma with other existing treatments is its regeneration potential. Injecting PRP doesn’t just correct the condition – it has the potential to make it a little better than before. As far as research is concerned, most of the PRP literature concerns around knee osteoarthritis. Here’s a Level 4 systematic review and a more recent Level 1 systematic review of 10 studies with a total of 1069 patients if you want to verify the results. Of course, it doesn’t mean all you need is a couple of PRP Injections and things will be better. Or maybe that’s it? If the big pharma is able to package this and market, they would’ve carved out a multi-billion dollar market by now. But they can’t because the primary raw material – blood – has to be autologous and fresh for this to work efficiently. Some researchers are exploring the possibility of freeze-drying Platelet-Rich Plasma. This may or may not work depending on how well it can preserve the key elements of Platelet-Rich Plasma – the bioactive proteins in the platelets, plasma and white blood cells. According to Bert Mandelbaum, MD, DHL (Hon), Chairman of Santa Monica Orthopaedic & Sports Medicine Foundation and Co-Chair of Medical Affairs at the Institute of Sports Sciences, Cedars-Sinai, Platelet-Rich Plasma is more promising than stem cells. See his recent article in Medscape here. Still there are plenty of doctors who comes to us asking, “Where is the research? The FDA-cleared prospective, multi-center, sham-controlled, randomized, double-blind clinical trials?” Actually, the FDA is hard at work clearing devices that provide relief of pain and symptoms associated with knee osteoarthritis (OA) for up to 90 days by nitro-freezing the nerves! The amount of research from independent research institutes around the world on Platelet-Rich Plasma is just a tad bit overwhelming. New findings are published almost every month on the topic. The vast number of research mirrors the immense potential of PRP Injections. And for knee osteoarthritis, there is already unquestionable proof. Caring Medical’s Ross Hauser, MD has written a well-researched article about Platelet-Rich Plasma for knee osteoarthritis here. Dr. Lewis G. Maharam, MD, FACSM, one of the world’s most extensively credentialed and well-known sports health experts known as Running Doc™, always show great enthusiasm when describing Platelet-Rich Plasma. Best selling author and team physician of Philadelphia 76ers, Dr. Nicholas DiNubile MD recently wrote an article saying Platelet-Rich Plasma may make knee-replacement surgeries a thing of the past. Famous Long Island physician Dr. David J. Weissberg, MD, says for his patients, with just one shot of PRP, in general, gets relief from their problems without any need for surgery and slow but progressive cure in their problems. in an FDA approved Level 1 clinical study utilizing cell therapy techniques. Here’s a recent testimonial from one of his patients. Of course, there are many more. But for those who’re skeptical in trying Platelet-Rich Plasma or even offering them to their patients – a doctor once told me he’s skeptical because he might appear as a greedy physician to his patient if he offered unproven techniques for the sake of trying it – they can rest assured that many nationally reputed doctors are ardent fans of this therapy. Plus, there’s really no risk in trying it. We know many of your patients rely on medical insurance coverage for their osteoarthritis and other treatments. And many of them are pensioners. Asking them to pay out of their pockets for a treatment that you yourself have doubts in – that’s impossible. While we hope the insurance starts accepting it, we can’t just ignore the results. You’ve seen the research, and heard the testimonials and read the media pieces. So instead of wondering whether it might work – why not give your patients a try. Give the first treatment for FREE. Yes, I’m suggesting you let your patients try it out for FREE. From what we’ve seen so far, once patients clearly experience the healing results – they’ll come back for more and you’ll more than make up for the FREE treatment you provided them. We’ve seen over and over again – in several clinics – that patients always come back for more. Like this case from Dr. Payel Banik’s office. (Dr. Payel is the owner of Osteopathic Healing Hands, Houston, TX.) The patient in the video below explains why he’d come back for more. So what do think? Are you going to stand on the lines and watch until government regulatory boards mandate PRP for osteoarthritis and other conditions? Or are you going to start helping your patients right now? Start offering it for FREE so that YOU will be convinced that it works. And win over your patients in the process. And watch them come back for more. If you’re seeing a lot of patients with intermediate to advanced stages of osteoarthritis or other similar musculoskeletal conditions, offer them a FREE Platelet-Rich Plasma injection starting today. We’re very confident that it will make the fall in love with this treatment for life! There will be plenty of referrals for you. All you need is a PRP Kit and a compatible centrifuge and you’re good to go. Call us at (844) 377-7787 if you need more info. Shelly (not the real name) had been suffering from Achilles Tendonitis for a while now. She has rheumatoid arthritis and celiac disease. Plus she had a minor surgery on one of her toes and it had gone a tad bit bad. She was determined to find a solution and started with all the usual treatments. When it became obvious that the solution she’s looking for is not so straightforward, she began flirting with alternate treatments. Someone suggested Platelet-Rich Plasma. And so began a love-affair. This is what Rheumatologists can expect when they introduce Platelet-Rich Plasma to their patients. Rheumatology is one of the fields of medicine that has immensely benefited from the advances of Platelet-Rich Plasma. Because it turns out that Platelet-Rich Plasma Injection is one of the most simplest treatments for musculoskeletal diseases – those that affect the joints, muscles, and bones, swelling, and deformity. However, they have not been pushing the limits of this novel treatment, as well as the dermatologists. If you are, I’m pretty sure you have tried Platelet-Rich Plasma for your patients. And if you did, you may have saved a few of your patients from going under the knife. But not every Rheumatologist have bought into the idea of Platelet-Rich Plasma. This is unfortunate since just in the osteoarthritis segment alone there are over 27 million U.S. adults who’d be much happier if their rheumatologist had suggested Platelet-Rich Plasma Injections. Like Kenneth (not the real name), who was part of an experimental group at a local university and got PRP Injection for his torn hip ligament. Prior to this, he was told that he’d need surgery. But three (!) years later, the pain has never really returned and he’s had no surgery. Another patient, Desiree (not real name), said she and her husband are firm believers of the treatment. It shoved her plantar fasciitis into oblivion and gave her husband’s shoulder joints and knees a big boost. Cases like these are not rare. We’d be the first to admit that we’ve seen quite a number of cases where Platelet-Rich Plasma failed to show improvements. Sometimes, we’ve seen cases where the same patient can have mixed results. Like Lynda (not real name) whose PRP treatment for her severely sprained right ankle worked like a charm whereas the one for her similarly compromised left big toe turned out to be a dud. But we can improve the chances of success dramatically by adhering to a standard for the following. By definition, PRP must contain a higher concentration of platelets than baseline. This can vary as the baseline, which is the platelet concentration in the patient’s blood, varies. But the use of a good PRP kit like this can result in a concentration that’s 5X-8X times the baseline concentration. This kit can also be used to get a downgraded sample with 2.5X – 3X times the baseline concentration, which may sometimes be required based on the treatment performed. Therefore, getting a PRP kit that only produces lower grade PRP is not advised. PRP containing white blood cells have a different biologic effects than the ones without. The most popular form of PRP is L-PRP which contains Leucocytes. The DrPRP Kit which provides higher concentration of platelets delivers an end product that’s classified into three fractions: the Red Blood Cells (RBC) without platelets, the Platelet Serum in which the platelets are suspended and the Buffy Coat which contains both the platelets and white blood cells (WBCs). This makes it possible to adjust the end product to include some White Blood Cells. Because, the macrophages (circulating monocytes) present in WBC can remove debris and ingest harmful foreign particles, bacteria, and dead or dying cells to speed up the healing process. The standard protocol for Platelet-Rich Plasma requires the addition of an Anti-Coagulant (ACD) to prevent the blood clotting. The addition of ACD makes the blood more acidic than normal. This can have a negative effect on the half-life of growth factors. So in certain cases, we recommend buffering the PRP back to a physiologic range prior to injection. The Platelet-Rich Plasma owes it’s healing prowess to the growth factors found in platelets. They are made accessible to the tissues and ligaments when the platelets are activated. The exact roles of these growth factors remain a bit vague at this time but from what researchers have been telling us it is evident that they support a wide range of processes in all three of the healing stages – inflammation, proliferation and remodeling. Here’s a nice little infographic that lists out the functions of the primary growth factors in Platelet-Rich Plasma. In recent years, Platelet-Rich Plasma has proven to be effective for Subacromal tendonitis. In a study conducted by Dr. Turlough O’Donnell, MD, and Aamir H. Shaikh, MSc, MRCSEd, MCh, of UPMC Beacon Hospital in Dublin, Ireland, 102 patients were treated with PRP injections administered directly into the suprasimatos tendon (shoulder) and 102 patients were treated with treated with 20 mL solution of 0.05 percent bupivacaine and 80 mgs of methylprednisolone. “At 12-month follow-up, patients who received a series of PRP injections were 16 times less likely to have undergone surgical intervention than patients who received corticosteroid injections,” the authors reported. Epicondylitis is often a chronic case of tendinopathy and a healing response is usually hard to obtain. Platelet-Rich Plasma’s role in this started in 2006, when in a Pilot study by Allan Mishra, 19 patients with refractory epicondylitis who were prescribed surgery, was given a single Platelet-Rich Plasma injection. After 8 weeks, patients reported 60% improvement which rose to 93% and after just two years. In another controlled clinical study, the effect of PRP was compared with corticosteroids, in a randomized, double-blind manner with 100 patients who had chronic epicondylitis. After one year, the authors concluded that PRP significantly exceeded the clinical benefit obtained by corticosteroids. Plantar fasciitis is one of the bigger fields in rheumatology – and the standard procedure for rheumatologists has been to mask the symptoms using corticosteroid injections. However, in this study, platelet-rich plasma injection was found to better than corticosteroid injections at the three-month follow up. There are multiple studies in the past 3 years, both controlled and open, which highlight the efficacy of Platelet-Rich Plasma for Knee Osteoarthritis. In the largest of these studies, researchers in Taiwan, conducted 8 single-arm studies, 3 quasi-experimental studies, and 5 randomized controlled trials with 1543 participants to validate that Platelet-Rich Plasma does improves outcomes for patients with knee joint cartilage degenerative pathology. And does that better than Hyaluronic Acid. However, recent research suggests that a combination of HA+PRP may be even more effective. Platelet-Rich Plasma Knowledge Mandatory For Rheumatologists? There is no doubt that Platelet-Rich Plasma is here to stay. And it can be the biggest item in the rheumatologist’s therapeutic rolodex. The safety, efficacy and simplicity is something that no other treatments can rival. However, as I mentioned before rheumatologists have not been taking advantage of it as much as others. Perhaps they are waiting for more conclusive evidence or insurance acceptance of the procedure, but considering that this procedure carries virtually no risk, it’s the somewhat of duty of every rheumatologist to give it a try. And come to new discoveries of their own. You can try this at a relatively inexpensive way – with this kit and a standard lab centrifuge like this. The medical community need more rheumatologists’ acceptance of Platelet-Rich Plasma to formalize the frequency, volume and etiquette for this life-saving procedure. After all, there are 27 million Americans at stake here. Plus, the Platelet-Rich Plasma industry is undergoing rapid changes. New innovations are added every month. Getting in the game in these early stages will make you one of the pioneers in the field. Here’s a recent interview with Dr. Lance Johansen who says we might see Platelet-Rich Plasma being combined with genetics like Bone morphogenetic proteins (BMPs) and DNAs to help grow new cartilage. Fact: According to research, PRP treatments are one of the most in-demand treatments available in healthcare. This is impressive considering the following. PRP is not supported by the medical industry. No big pharma funding on extensive research or marketing. No medical associations lobbying to increase its awareness. PRP is shunned by the insurance companies. No reimbursements from them. So getting patients to pay is difficult. Especially for a treatment that’s relatively “unproven” like this. The cost of PRP treatments are actually rising. In 2006, you can get a PRP treatment for $450. Today it costs $800. The cheapest we’ve seen is $650. The prices are still robust as demand keeps up. However, we believe the best of PRP is not even here yet. We’re just one breakthrough study away from exploding into mainstream hospitals and clinics. We see the biggest growth in Platelet-Rich Plasma happening in Asia. The growth can be attributed to PRP’s fundamental healing property. More platelets. More growth factors and cytokines. And therefore more healing. It’s as simple as that. And no one can argue this fact. Our body’s natural healing mechanism operates with 150,000/ul-350,000/ul platelets in blood. Using Platelet-Rich Plasma means this number is amplified by 3X to 5X. How can this be not translated into better healing? Believe it or not, the best orthopedic doctors use Platelet-Rich Plasma. And do so regularly. PRP can be used to promote healing of injured tendons, ligaments, muscles, and joints, can be applied to various musculoskeletal problems. And they conduct regular studies to test it’s effectiveness. One landmark study involved double-blind randomized controlled trials to see the effect of PRP on patients with chronic low back pain caused by torn discs. The study outcome says 60% of the patients felt significant improvements. So far, there are the following type of PRP variants. All of them involve Plasmapherisis — the two stage centrifugation process to separate platelets from blood. However, what happen what happens after that can be different. And the industry hasn’t found it’s middle ground as to which variant to be standardized. We believe the confusion will clear up in 3-5 years. Why is the treatment commonly used for wound healing and pain management? The answer is because the platelets’ main job is to aid coagulation, act as a biological glue and support stem or primary cell migration. In addition, it also helps in restoring hyaluronic acid and accelerates the synthesis of collagen and glycosaminoglycans and increases cartilage matrix. Not only that, the platelets are delivered in a clot which means it can immediately act as a scaffold to enable the healing process. 95% of the bio-active proteins are released within 1 hour of injecting Platelet-Rich Plasma. The platelets continue to release growth factors for 7-10 days. Thus it’s recommended to re-inject PRP every 7 days. Why are patients coughing up their hard earned money for this? This reminds me of hundreds of thousands of PRP treatments paid from patient’s own pocket even though they’ve been paying for years to get covered by their respective insurance provider. In 2015, PRP costs were anywhere between $600 and $800 per site per treatment. And most patients go for repeated treatments. So why were they forking up their hard earned money if the treatment was not working? Weren’t there any better alternatives under the “coverage” of their insurance provider? The answer is 1) the treatment works. 2) there’s nothing else out there that’s as natural and side-effect-free as PRP. Consider the case of osteoarthritis. 27 millions Americans are impacted by it. 33.6% of people older than 65 are victims. All of them experience gradual degeneration of cartilage and bones — they lose roughly 5% cartilage per year. Yet, our medical industry doesn’t have a fix to stop it. However, when doctors started doing PRP treatments for their osteoarthritis patients, they found a large majority of them had no further cartilage loss. To me, it means we should make PRP treatments the default first-line treatment for osteoarthritis across the country. Another huge market is hair loss and cosmetic facial applications. I know there are many people who believe PRP doesn’t work for hair. Here’s what one of the Platelet-Rich Plasma studies found were the effect of the treatment on hair loss. That number looks paltry. But that’s an 180% increase over the 2009 figure of $45 million. Consider this. Just for osteoarthritis alone, if all the 27 million Americans receive 1 PRP shot a year at a conservative $400 per treatment, it would be a market of $10 billion. And that’s one condition out of the many that Platelet-Rich Plasma injections are proven to work. Another condition that PRP is known to work very well is Tennis Elbow. It affects on average 1% to 3% of the overall population. That number is as high as 50% among tennis players. Just getting Platelet-Rich Plasma covered by insurance will unleash the market big time and will help heal millions of patients naturally, more effectively. Oh ya, that means the insurance companies will have to pay more. Why would they? HOWEVER, if this treatment could reduce further expensive intervention like surgery then it may actually be a blessing for the insurance guys in terms of savings. One surgery avoided by a patient through right intervention through PRP treatments will save the insurance companies at least $25,000. Now, that’s a win-win for both patients and insurance. I believe it’s a matter of time before insurance companies start realizing their folly of not supporting this treatment. The problem with PRP is that it can be used for just about everything, which is a good problem to have until health care officials (and insurance companies) start realizing that people are going to misuse it. So it’s classified as unproven. The VAST scope of the treatment calls for urgent structure and guidelines. There are some 20+ conditions where researchers have found it “helps” in one way or another. It’s a daunting task to prove its efficiency in all the areas. Nevertheless, we’ll get there. Though we’ll need a lot of funding for that. And yes, we need to standardize the procedure. As well as come up with optimized protocols for each conditions. Someone need to take initiative on that. We’re counting on independent doctors and medical institutions. The big pharma won’t jump in because what’s in it for them, right? It’s so simple, you’d be an idiot to not try it. You only need a vacuum blood harvesting tube like what we offer here, a centrifuge with adapter for the tube, pipettes and 10ml ampules of 10% calcium chloride. The only complexity comes from not following a standard PRP system. Because the final platelet count can depend on a variety of factors. Like initial volume of blood, the technique used and relative concentration of WBC and/or RBC. As well as on the patient’s side, there are factors such as age, growth factor and WBC content. However, concentration-wise, there’s little confusion as once a sufficiently high range is reached, more doesn’t have any adverse or enhancing effect — it saturates at a certain point. So that’s the minimum. Once you reach that, you’re good. Although the outcome is not always guaranteed to be same, with the right number of platelets, platelet activation and cytokine release, you can get a consistency in your PRP offerings. There’s still some uncertainty over the number of injections, the timing and delivery method of Platelet-Rich Plasma. But with wide-spread adoption, some kind of structure will emerge. Let’s hope the first glimpses of it will arrive this year. Do you know in 2015, the world saw approximately 1 million knee arthroplasties for osteoarthritis? At $25,000 apiece, $25 billion. How many of these patients had the good fortune of their doctor recommending PRP early on? Dr. Alain Elbaz is a leading Houston surgeon affiliated with Advanced Orthopedics and Sports Medicine LLP. He’s known for his quick adoption of the most advanced, and least invasive procedures. And so he regularly performs ultrasound-guided Platelet-Rich Plasma injections. Today, he’s treating a patient with Knee Arthritis. And he’s using PRP as a booster to stem cell procedure for arthritis. We captured Dr. Elbaz’s magic on camera. Dr. Elbaz’s main specialty is shoulders and he’s one of the few surgeons in Houston, Texas who has trained in Lyons, France to perform the Latarjet Shoulder stabilization procedure. To learn how to prepare Platelet-Rich Plasma using Dr.PRP Kit, click here to watch video. Platelet-rich plasma (PRP) injections are one of the most controversial, but potentially highly effective solutions for a wide range of medical ailments. PRP injections have come to the forefront as a treatment option as many well-known athletes have used them to get back on the field or golf course sooner. Often considered a treatment for knee pain and chronic tendon injuries, they are consistently sought after by patients as a fast solution to chronic or acute situations. Yet, controversy exists in whether or not this treatment option is effective or nothing more than a placebo. What’s truly the problem with using PRP injections? Is there truly a problem with using them? The treatment is often hailed as an effective solution for many needs. It’s a jack-of-all-trades. With such a large range of potential areas to help, there’s little doubt it could prove to be one of the simplest go-to-solutions available. There are several areas of doubt. First, its effectiveness is hard to measure. It’s hard to measure its efficiency as well. Additionally, there is a significant amount of variability in effectiveness because this is a patient-derived product. That unknown factor offers some specific concern. What works for one patient may have no effect on another patient due to the composition of platelets. Others find it’s a virtual miracle solution. There are some orthopedic specialists and prolotherapists who believe it is one of the best solutions available to quickly restore functionality to the patient. This group is actively marketing PRP injections to many groups of people including those seeking help for arthritis pain and those in need of clinical dentistry. It’s even being used as a solution for hair loss treatments. Then, there is another group of people. These outright reject the potential benefits and functionality that PRP injections can offer. They claim it’s nothing but a placebo. These are valid points, but it all comes down to this. There are numerous instances in which PRP injections are working. Many professional athletes with various types of injuries are seeing improvements and success. And, there is very little risk present. At the end of the day, why not try it? Science has taken on the topic of PRP injections in a variety of studies. The goal is to determine if this is a true solution or nothing more than a placebo effect. Take a look at a few examples. In one double-blind, randomized trial, researchers worked to determine if treatment with PRP was more effective than the use of a placebo in the treatment of knee osteoarthritis. The group followed 78 patients with bilateral OA spread over three groups where the first group received a single injection, the second group received two injections three weeks apart and the final group received an injection of saline solution. Both groups saw improvement over those with saline injections. Those who received two injections saw the highest level of improvement. In another study, where researchers looked at 10 trials to determine the effectiveness of PRP injections in osteoarthritis in the knee, the group found interesting results. The group considered decreasing pain, improved function, changes in joint imaging and global assessment. They found that PRP injections do reduce pain more efficiently compared to a placebo. Set aside these trials for a moment. Put aside all of the satisfied people who have used PRP injections previously. There are some studies and trials that have shown that PRP did not perform any better than a placebo. That’s an important statement to make because, as mentioned, the results of these injections do vary a great deal. But, don’t count out that benefit itself. Now, consider the placebo effect itself. There are numerous studies easily found that show that the placebo effect actually is effective. In hundreds, if not thousands, of cases, placebo pills and injections, which are often nothing more than saline, have shown to be helpful to patients. In fact, in many of these trials, well-known, highly effective drugs that are used every day for treatment of conditions did not perform as well as placebos. What does this mean for PRP injections? In short, it means it is not possible to use placebo effect itself as a sole yardstick for measuring the effectiveness or use of these injections. Ultimately, it depends significantly on the faith of the patient involved. Many people dispute the effectiveness of the placebo effect. However, consider anti-depressants. Unfortunately, patients are prescribed these medications by doctors at even the slightest mention of any depression-like symptoms. Anti-depressants are a billion dollar industry on their own, accounting for as much as $12 billion in the United States annually. Anti-depressants are supposed to work by repairing the chemical imbalance created in the brain by a lack of serotonin. However, numerous studies prove that simple placebo pills can produce the same results as actual anti-depressants—they actually increase the serotonin level in patients as well. Which means that placebos do the same thing that medications do but they do it without the harmful effects. It’s clear to see the patient’s desire to improve is often the underlying determent of success. Arthroscopic Knee Surgery Not Better Than Placebo? Placebo effect doesn’t just apply to pills. Consider the case of arthroscopic surgery for osteoarthritis of the knee. According to this article in New York Times it doesn’t fare better than Placebo either. More and more studies are proving it. Yet, 700,000 of these knee arthroscopies are performed every year. And that is for a condition that could be treated non-invasively through Platelet-Rich Plasma. All because arthroscopy is an approved treatment and so patients can get it done for free. On the other hand, Platelet-Rich Plasma is 1) much safer with zero side effects, 2) doesn’t take much time to administer and 3) it actually heals the degenerated area. Now, let’s come back to the effectiveness of PRP. A good place to look for information about the placebo effective as it relates to PRP is in animals. Generally, we understand that animals are not susceptible to the placebo effect. There are some studies that show there is some improvement, but it’s not anything like what humans experience. But, there’s plenty of evidence that shows that horses, dogs, and other animals benefit from Platelet-Rich Plasma injections. It’s clear there is an impact here. Check out this video for more information. What is the solution here? Should patients be given PRP injections? Ultimately, we know the facts. PRP is a simple and fast way to provide natural growth factors to a patient’s injured area. It is well documented in medical science that growth factors speed up and improve the overall healing process and quicken cell regeneration. That’s the true key here. There is clear reason to use PRP injections as a first line treatment for many injuries and chronic pain situations. It can help those facing arthritis, improve joint movement, quickly aid in the repair of ligament tears, and resolve even long-term chronic pain in tendons. It’s even effective in treating skin conditions. To reach a unanimous consensus among medical professionals, what we need is more human randomized controlled trials. And develop a standard protocol. Specifically, there 4 things we’d need. Take the time to learn more about PRP Injections. There are few reasons to limit patients from a product with so much potential and so few risks. Approximately 600,000 people seek treatment for Osteoarthritis here in the US every year. Half of them are for knee. Our nation spends more than $150 billion dollars for the treatment. Unfortunately, knee experts (mostly surgeons) believe that there’s no cure for knee degradation. They believe knee-replacement is the only option. Is this true? Let’s take a look. What is Osteoarthritis And How to treat it? Osteoarthritis is the most common form of arthritis in the knee. It is a degenerative “wear and tear” type of arthritis that can affect people of all ages. It results when cartilage in the knee wears out. The natural solution to this problem is to repair the cartilage. Except that surgeons believe there’s no solution that can repair and renew cartilage in the joints especially knee and hip. Or is there? A report from Bioresearch Foundation of Milan, Italy, shows us there is. Platelet-Rich Plasma. The guys from Bioresearch Foundation did a 2-year study on 93 patients with advancing osteoarthritis — meaning they were the kind of candidates that opted for arthroscopic surgery. The researchers then administered a simple course of 3 monthly PRP injections instead of surgery. A total of 119 knees were treated. After 12 months, they randomly increased the dosage of 50 patients to 6 monthly injections. The results were this: All of the patients experienced significant improvement in pain, mobility and disability score — this was tested throughout and after the 24 months. Of the 50 patients who had 6 monthly injections after month 12, enjoyed even more improvement. Surgery was completely unnecessary for all of them by this point. It’s in the title of this blog post: it’s a shame to not try PRP. Consider a knee or hip replacement very carefully. Sometimes, a worn out cartilage isn’t the cause of the pain as shown by the famous Framingham study group in the New England Journal of Medicine. Even though MRI’s show cartilage wear and tear, most people have them as well. Plus, for a good number of patients, their results after surgery is far less that what the patients at Bioresearch foundation had after Platelet-Rich Plasma injection — it’s not uncommon for patients to experience more pain after surgery. Here’s an infographic to remind you of your options for Osteoarthritis. Dr. PRP USA LLC. is located in Missouri City, TX, and specializes in new innovative products for PRP Regenerative Therapy. Sign up to receive Dr. PRP USA LLC. updates. You'll receive latest industry news, new innovations and monthly deals for Dr. PRP products. Once you enter your email and confirm you'll receive the link to order your samples. Plus, you'll also be subscribed for updates and news from the Dr. PRP USA team.